Tokyo kaihou-ku at Isetan, Shinjuku, Tokyo. “Glitch image” that was purposely created using bugs and errors. 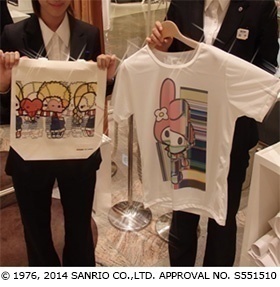 This art collaboration used glitch images, Sanrio characters, and a Mimaki printer. 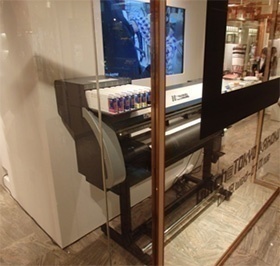 The Mimaki sublimation transfer printer “TPC-1000” was used to demonstrate printing at an event “Glitch@TOKYO kaihou-ku,” which was held from June 18th to July 1st, 2014 in Isetan, Shinjuku, Tokyo. TOKYO kaihou-ku is at the forefront of fashion trends and demonstrates its fascination with fashion via unique cultural and creative works in Tokyo. This event* was named “Glitch @ TOKYO kaihou-ku,” and it focused on a “Glitch image” that was purposely created using bugs and errors. 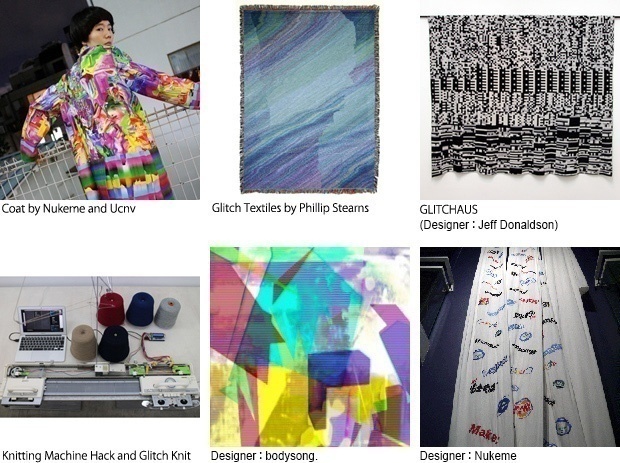 This art collaboration used glitch images, Sanrio characters, and a Mimaki printer; moreover, it showed how apparel design can be liberated from conventional concepts. *The Glitch @ Tokyo kaihou-ku has already finished. 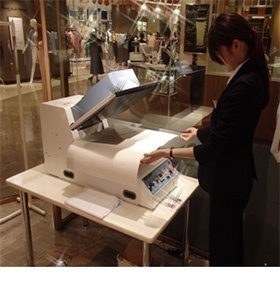 Currently, the TPC-1000 printer, and it is not being demonstrated at Isetan, Shinjuku Tokyo. The TPC-1000 is an inkjet printer and cutter for professionals, and is usually installed in factories. 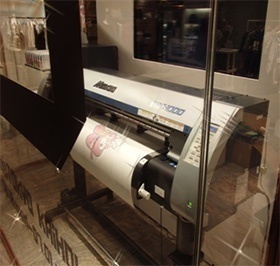 Visitors who came to Tokyo @ kaihou-ku were amazed at this wide-format professional use printer, as they had never seen such as a printer before. ①A visitor selected a glitch design from the image data designed by the designer Ucnv, and the selected design was sent to the Mimaki TPC-1000 printer. ②The TPC-1000 printer printed the data, and then cut the printed transfer paper. ③The printed image was transferred onto fabric using a heat press machine. Please visit the Mimaki website for more information about transfer printing. ④Finished! The custom-made printed goods were quickly created at the Glitch @ Tokyo kaihou-ku venue. Mimaki interviewed Mr. Ucnv, who designed the glitch images for the TPC-1000 printer. M (Mimaki): I would like to ask you about your art works. How do you usually produce your works? U (Mr. Ucnv): Due to the nature of glitch art, I usually publish my work using digital data but I also have several other ways. 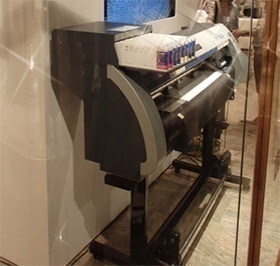 I have used a digital textile printer for apparel designs. Recently, one of my works was printed on photo paper. M: Thank you for selecting the Mimaki printer from a wide range of alternatives. How did you get the idea to install the printer at the department store? 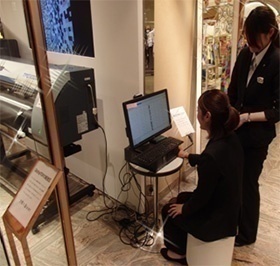 U: I simply thought that it would be fun if there was a printer on the Isetan sales floor. M: It is a very interesting idea. U: Generally, consumers have a chance to see the finished works on the web or at the store but do not have a chance to see the art work creation process. I wanted to offer visitors a new experience, and I got the idea to show them the actual printing process on the sales floor. M: It must have been an absolutely new experience for them. U: Definitely, the atmosphere in the event space was beyond my expectation. The concept of this glitch art event was to “Change an ordinary object into a strange object.” Thus, the event space represented this event concept. 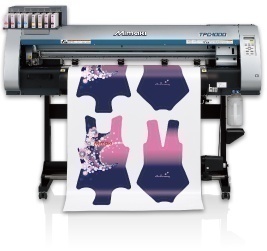 M: Was the Mimaki TPC-1000 printer useful for you? U: Yes! I assumed that the inkjet printer would be unable to reproduce deep colors, but I was wrong. I was surprised to see the print results. The printed colors were so vivid and vibrant! I am completely satisfied with a capability of the TPC-1000. M: Thank you for the compliment. Are you going to use the TPC-1000 in the future? U: I would love to use it when I have a chance. Next time, I would like to print the glitch image onto a whole surface. The original meaning of the word is an error or an inexplicable problem or condition occurring in a system. Recently, it has been used for an art technique that purposely generates a broken image. The TPC-1000 prints an original image onto transfer paper, and then immediately cuts the printed image.